Vietti is the name of the winery. Roero is the area in the northwest region of Piemonte (Italy) where the Arneis grape that makes this wine is grown, so the label pretty much tells you everything. This wine is estate bottled (bottled by the grower). Its nose delights with citrus and its taste offers citrusy orange rind, with a kiss of lemon and honeydew melon. Serve chilled, but not so much that you miss enjoying the wine’s slight minerality. This is a refreshingly crisp wine; unoaked, unfiltered, dry and of medium body from 25 year old vines. It is fermented in stainless steel to preserve fruit, and its fruit-acid balance is elegant. The Arneis grape is often blended to soften (red) Nebiolo wines. But I’m thankful to Alfredo Currado for making this 100% varietal. Enjoy this wine with hors d’ouevres, crudités, lightly, spiced seafood, and creamy cheeses. Use it as a poaching liquid for fish, or just enjoy it alone. As for me, the next bottle is earmarked for mussels in wine/garlic sauce with a crusty whole-grain baguette for dipping. Vietti is a well respected “house” that produces Moscato, Dolcetto D’Alba, Barbera D’Alba and D’Asti, Nebbiolo, Barbaresco and the prized Barolo. There are some labels that earn my trust no matter the variety. This happens after many years of drinking that label’s wines and consistently having an enjoyable experience no matter the varietal. Vietti is, for me, that type of label. If you’re looking to expand your experience with different wine grapes, you should try Vietti Roero Arneis. I found it priced at $21 U.S. and will keep several bottles as a staple in my white wine collection. 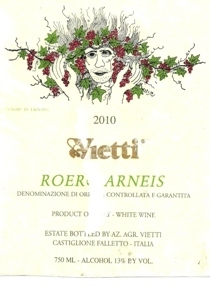 I recently opened a Vietti Roero Arneis 2011 vintage and was very pleased with the consistency. Enjoy the 2010 now through 2013. Add a year for the 2011 vintage.